Cupcakes 'n Daisies: We have a winner . . . So, a funny thing happened when I was cleaning out my fat quarter bin, I pulled out a stack of fabric I had rejected from previous projects and knew I would never use in future projects, and wondered, "would anyone else want this fabric?". I almost didn't even offer it up, truly, but I thought to myself, surely one person out there could use this fabric, it is nice quality fabric. No one is more surprised than me that 296 folks spoke up in the course of a couple of days saying they had a use for those fat quarters. And no, you didn't need a blog to be considered, and yes, sending an email for the folks who were comment challenged was fine. "If more than one person is interested..." LOL! I love to make scrappy quilts, so these fabrics would work well with my stash. :-)"
The giveaway post received 282 comments and I received 14 emails for a total of 296. I'm so thankful for Random Number Generator, I could never select a favorite from the comments, I wish I had a box for each of you. Funny aside, my blog posts average 700 hits, for some reason, this post had over 1100 hits. I"m not quite sure why this blog post had so many additional hits, but I do find it interesting that around 800 folks looked at that fabric and passed! 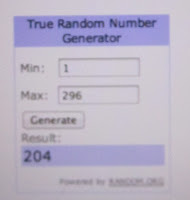 Here's the good news, I have some more cleaning to do and will have a few more boxes of fabric, but instead of posting it on my blog, I"ll just let Random Number Generator pick another winner from that post. So don't be surprised if you get a note sometime asking if you're interested in some fabric. Speaking of fabric, my Fat Quarter Shop fat quarter bundle is available! Click here to check it out. I'm still waiting for my bundle and am on pins and needles with regards to how those reds play together. If you get your bundle before me drop me a note and let me know what you think. Finally, I added a Flickr Link on the left hand side of my blog that is a nice little slide show of the blocks folks are making for Monique's Blogger Girls BOM. Those dancing robot heads are growing on me! Enjoy your weekend, hope you get some sewing in, I'm planning to! Did I just say that I didn't need any more fabric? I LOVE Thelma's Choice and will be ordering it. Now I just have to reorganize a bit so there is room on the shelf for it! WOO HOO! GO Betty! Have tons o'fun with that stash of fabric! Lucky Betty! And how kind of you to give all of us another opportunity to become owners of fabric from your stash! Lucky us! Thelma, your bundle looks fantastic! Congratulations Betty! And Thelma, it was extremely generous of you to offer so much fabric. I'm sure she can make some beautiful quilts of it. Have a fabulous weekend! Thanks so much for your generosity! It is so exciting to be the winner! It will be fun to see what treasures are in that box! Congratulations to Betty. What a treasure she will have arriving in her mailbox. Congratulations Betty! and this give away was so generous. Thanks for the fun! Amazing how many lurkers come out of the woodwork when there is a giveaway! Lol! I'm sure Betty will have lots of fun with all of those fabrics! Parabéns Betty! !Vai ser uma festa...E Thelma eu estou na minha torcida de novo,obrigada por generosidade. Congrat's to Betty! I had my fingers crossed too. LOL I am anxiously awaiting your bundle too! :-) Have a happy weekend! Congratulations Betty and also Thelma for doing the contest. I did check out the Fat Quarter Shop and have my order placed....will get on Wed. of next week.....can't wait. Thanks Thelma and will work with my new quilt project I am starting. Too funny...I remember reading that comment,congrats to the winner! Thanks for keeping our names in it too, love your bundle...may need to splurge! Congratulations to Betty, you Lucky girl. Thelma, yes, I am one of the 800, but I decided International postage is way too costly. So, congratulations to Betty, she will surely enjoy her win. Congrat's to Betty and thank you for keeping our names in ... I don't know of a single quilter that would not like to get "new" fabric in the mail. We all love treats..
Congratualtions to Betty. She is going to be watching for the mailman...what a happy mail day that will be! Very generous of you to do that. Happy Sewing. Betty is very lucky! I can't wait to see what else you cull from the herd!! Also to see your bundle. I only didn't comment, Thelma, coz I don't need anymore fabric for stash - even if it's free! And you know me, I like the stuff you use, not the stuff you pass on! Wow, your blog averages 700 visitors per post? You must be a blog rockstar!? I haven't begun one yet, mostly time constraints, but I wonder if anyone would read my musings about my messing about with fabric and dreaming of it. I don't believe my Mum even would! Thanks, Thelma for being so generous! I can't wait to get my hands on your red bundle from FQS! Love your red bundle. Love reading your blog, although I don't always leave a comment. I know bad blogger. Thank you for the chance. Congrats to Betty!! Always happy to see any good fabbie go to a good home! i guess i'd better go back to THAT POST and add a comment - ha ha ha!! !